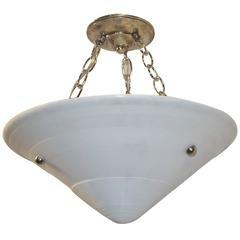 Rare industrial milk glass flushmount ceiling light. 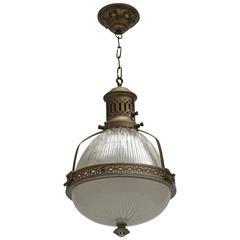 Designed and manufactured in the United States in the early 1900s milk glass, with all original patinated brass hardware and two way bulb cluster with original turn keys on sockets. 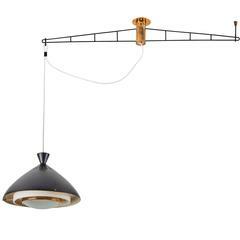 Original brass canopy and stem, customization of height not available for this fixture. Rewired for US junction boxes. Takes two E27 75w maximum bulbs. 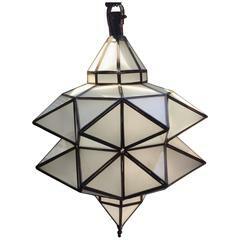 Art Deco pendant light. Measures: Diameter 26 cm. Height fixture 38 cm. Total height 65 cm. 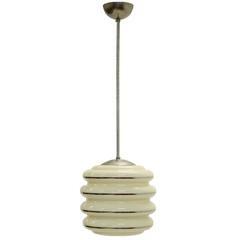 French 1950s ceiling single light pendant with milk glass shade. French circa 1930s milk glass pendant light fixtures with interior lights Measurements: Height (current drop): 15″. Diameter: 16″. Beautiful italian cone ceiling lamp in clear glass. Moroccan pendant with geometric designs.